It’s not easy crossing the fabled Iron Gates of the SLC, even for a goddess. On a recent afternoon, Chanira Bajracharya, the Kumari of Patan, greeted her visitors with composure and patience very unlike her tender age. For nine years, she has been the Living Goddess of Patan, and now, very soon, she will appear for the School Leaving Certificate Examinations with nearly 400,000 students across Nepal. At that moment, the Goddess will become a mortal, much like any of us. Sitting on a long sofa, the Kumari answers in monosyllables, preferring English over Nepali. At times, she chuckles, but she is quiet mostly. In between our conversation, she peeks through the latticed window of the four-storey house at Hakhabahal to look at the passers-by below. But beneath the veneer of the divine is a girl who has very little exposure of the world outside. Instead, her knowledge comes from books gifted by foreign visitors, books such as Guide to Space, Kingfisher Book of Space, and Atlas of the World. There is a keen sense of curiosity within her, and she says she has read all of them. The spacious room where devotees pay her a visit today will double as an exam room from March 25. A solitary desk, and two guards—that is all the company she will have in this exam centre. The Patan Kumari is a student at Bhassara Secondary School in Purnachandi, a ten-minute walk from her house. But she’s never been to the school. Instead, her teachers come home to teach her. Her birth parents have also hired private tutors for her. But it’s difficult knowing about the world, and learning about it from books alone. When her social studies teacher talked about the trafficking of Nepali girls to India, she could not understand what she was talking about. Similarly, when she was given an assignment to write about footpath vendors, she was dumbfounded, for, obviously, she had never seen one or eaten the street-side food that many sell, and many her age relish. The only friends Chanira has are her two brothers, aged nine and 12. She likes to sketch, a trait she might have inherited from her father, who is also a painter. But being a goddess can be “interesting”, she says. Ornately dressed in her bright-red gown, a very-conspicuous painted third eye in the middle of her forehead is accentuated by kajal on both her eyes. Chanira replaced Chandrashila Bajracharya, the Kumari of Patan on April 6, 2001. Chanira was only six; the eldest child of Netra Raj Bajracharya and Champa Bajracharya. Two months later, an enraged Crown Prince Dipendra killed his parents, and the downfall of the Shah dynasty had begun. Chanira’s mother recalls the Kumari hadn’t spoken for several days before the massacre—a portent of the misfortune that was to fall on the nation. The Kumari is believed to be an incarnation of the Goddess Taleju, and the tradition of a Living Goddess has its roots in the 17th century legends surrounding King Jaya Prakash Malla. According to them, Jaya Prakash Malla (in some version it’s Pratap Malla) was playing a game of dice with the Goddess Taleju when the king lusted after the goddess (in yet another version, the king’s wife heard her husband conversing with another woman and entered the room that was barred to all). A furious goddess was then placated by the king, and she vowed to reappear in the body of a virgin girl thereby sending him into a frenetic search of her mortal manifestation. There are strict rules for the Kumari that have been well-documented in several books. The girl must be a Newar, prepubescent, and endowed with battis lakshan (32 ideal characteristics). These include “a neck like a conch shell, eyelashes like a cow, chest like a lion, voice soft and clear as a duck’s”. While the girl is a Kumari, she should not be seriously ill, and there should not be any loss of blood from her body such as the beginning of her menstrual cycles. This effectively marks the end of her tenure. The institution of the Kumari is emblematic of the syncretic Hindu-Buddhist culture prevalent in the Valley. 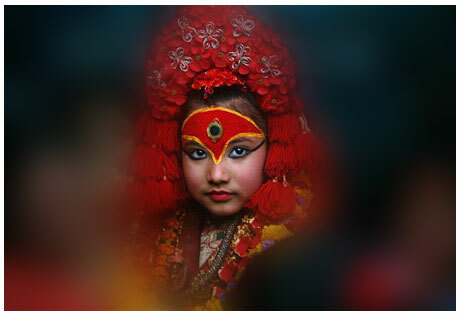 While all the three cities of the Valley have a Kumari each, the Kumari of Kathmandu is considered the most important. Patan’s Kumari may not be as famous as her Kathmandu counterpart; nevertheless, she plays an equally important role during festivals such as Indra Jatra, Machchhindranath Jatra, and Dashain. She’s allowed to venture out 19 times a year, mostly during festivals. In Kathmandu, the Kumari is chosen from the Shakya clan, whereas in Patan, they come from the Bajracharya clan, the Newar-Buddhist priests. In recent years, however, the practice has courted controversy, with 2005 lawsuit by Pun Devi Maharjan demanding an end to the tradition, claiming the practice violated child rights. A year later, Chunda Bajracharya, a professor of culture at Tribhuvan University, filed another petition demanding the continuation of the tradition. Though a 2007 committee declared that the tradition doesn’t violate human rights, it also ordered the Kumaris’ parents to educate them. That is how Chanira came to study. And that is how the Living Goddess is preparing for the toughest exams, studying her course books three hours every day and attending tuitions daily in the mornings and evenings. On one such tuition, Abha Awale, her social studies teacher, asks her to memorise the five development regions of Nepal and prepare a list of UN agencies and organisations. A while later, the Kumari picked up a Creative English Practice book and SLC model questions from a row of her books behind her kept in order. Leaving behind their past, many Kumaris have opted for a career. Though a few have remained single, many have married contrary to the common notion that marrying an ex-Kumari is fatal. Rashmila Shakya, 28, who was a Royal Kumari from 1984 to 1992, and also co-wrote the 2005 book From Goddess to Mortal, has completed her Bachelor’s degree in information technology and is now a computer software developer in a private IT firm. Back at the Patan Kumari’s house, I ask her what she plans to do after the SLC. Or, for that matter, her post-Kumari life? Chanira is not very sure what her life would be like when her divine role ends. She wants to study commerce and pursue a career in banking. So maybe, a career switch from being a Living Goddess, to an investment banker is not too far-fetched a dream.